Built and maintained by the London Transport Museum Friends, and other volunteers, this 7.25" gauge railway is situated in the ground of the Museum Depot in Acton. The railway operates during open weekends at the Depot, carrying passengers on an out and back ride. The line is single with passing loops at either end. The AMR's only locomotive, a Metropolitan Railway Bo-Bo electric, has recently returned from overhaul and trains are operated with this and privately-owned visiting stock with a London theme. Regular visitors include a 1938 stock tube train and Metropolitan 4-4-0T Steam loco. Plans are afoot to extend the line further along the side of the depot, and to extend the permanent signalling (which is controlled from a redundant London Underground signal cabin lever frame). Opening Times: During depot open weekends, usually 11am to 5pm. See website for details of forthcoming open weekends. Fares: Depot Entry Fee: Adults £15.00, Concessions £11.50 (Allow 12 months free entry), Accompanied children under 16 free. 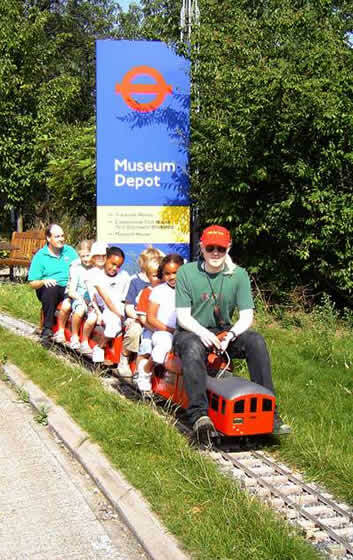 Train rides £1 for all. AMR Page was last updated on the 2nd January 2014 with history updated.